This is Steven Soderbergh's second film this year (third or fourth film depending on how you're counting and depending if you got the Che double feature this year rather then last.) Regardless, the guy is prolific with his "one for the studios, one for me" mentality and he is churning out fairly decent to great work. That's the consensus anyways as it appears that many people will take even a small role just to be in a Soderburgh film. Melanie Lynskey (Rose from Two and a half men) plays Mark's wife; Scott Bakula (Enterprise or Quantum Leap, take your pick) is FBI agent Brian Shepard; Joel McHale (from The Soup) is Shepard's FBI partner Bob Herndon; Patton Oswald (comedian and voice of Remy in Ratatouille) plays a government worker; Tony Hale (Buster from Arrested Development) plays Mark's lawyer; Clancy Brown (Inman from Lost), Thomas F. Wilson (Biff from Back to the Future) and even another Ocean's alum, Eddie Jemison make a stop. Like I said, it's a veritable smorgasbord or "Hey, it's that guy from that show/movie. You know. Whatsisname." Everyone gets an extra fifty points for every Smothers Brother they can point out. Soderbergh drenches this film in a yellow tint that, along with the fonts chosen, make this a cool throw back to cheesy spy films of the 70s. He plays fast and loose with any seriousness the film might hold. I especially enjoyed the clever way he used his music cues. During one of Mark's random ramblings (the film is full of them), with music playing behind a montage of fields and factories, Mark happens to mention Mexico and for two measures the music changes into a Spanish flare with horns a-blazin' before quickly changing back. During the movie's main take down scene where the FBI raid people's homes and you would expect to hear music thumping like nervous hearts or swelling heroically, instead Soderberg gives us a whimsical piece of melodic confection with kazoos. After the first time Mark meets with the FBI, music fit for any James Bond movie kicks in as we see him driving home. The music, along with most of the other choices, helps us get into the head of the Mark Whitacre, an odd place to be indeed. As I mentioned before Mark has a lot of voice over in this film spouting random – interesting, but random - facts that happen to pop into his head. The voiceovers often drown out Mark's own voice or the voices of other people who are talking to Mark, showing us yet another facet of his psyche. 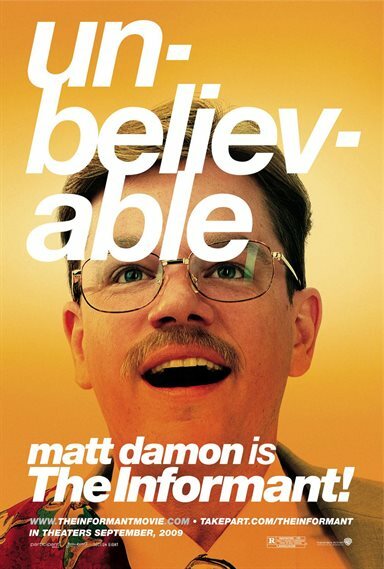 Matt Damon, who does his Raging Bull transformation by packing on 30 pounds for this film, plays Mark Whitacre with enough naiveté and short-sightedness to make him entertaining if not somewhat pitiful. Mark is someone who equates himself with Tom Cruise in The Firm. He's a man who refuses to take responsibility for anything, caught in delusions of grandeur and far too talkative for his own good. Watching him in the trailers, I saw a dorky lout caught in dealings beyond his reckoning and I went to the movie wanting to see more of this bumbling hero, along the lines of Get Smart. Plus since this was touted as "From the director of Ocean's 11, 12 and 13" I thought Mark might get into some sort of FBI caper. Instead what I got was far deeper and far darker then I was prepared for. If you're good armed with the knowledge that this isn't the comic romp promised in the trailers, good, enjoy the film. If not then, before you see the film, listen to the "This American Life" episode. Yes, spoilers will abound, if this film can be spoiled, however foreknowledge of who's who and why things are really happening will, I think, enliven the film. I don't feel the filmmakers were intending there to be a twist or a grand reveal. If they were, they did it poorly. What they did was play out a very intriguing story just as it happened and let the audience discover the truth along with the FBI agents who work with Whitacre. I can see why the agents were so frustrated. So there. Download The Informant from the iTunes Store in Digial HD. For more information about The Informant visit the FlickDirect Movie Database.